Well aren't these the cutest things? 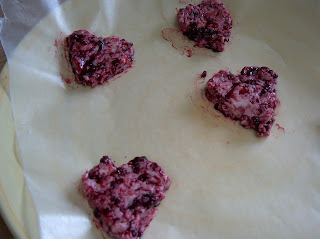 They're softened butter, mixed with berry jam then plopped onto wax paper and shaped into hearts with the back of a spoon. Wouldn't they be perfect to serve with toast for a special breakfast? Or to serve at tea time with scones? When the butter is soft, smush it into the jam with the back of a spoon. Make 5 little piles on wax paper, then use the spoon to shape into hearts. Refrigerate. Don't you think you could make these ahead and freeze them to whip out for company? And if THAT works, don't you think you could make up some honey butter and freeze in little heart shapes for eating with biscuits some evening? Or chive butter and freeze for serving with baked potatoes? Anyone have any great flavored butter ideas to share? NOTE: For more great ideas, check out Kitchen Tip Tuesdays at Tammy's Recipes. Oh those are cute! What a great idea! I'll have to share this with my mom...she's planning a brunch soon! Cute! this is such a great idea - thanks for the inspiration! Very cute - love this idea! I might could use it for a tea party we'll be having soon. Thanks for sharing! Hey there! Thanks for visiting my blog. I had to re-pay the favor. Now don't go expecting anything gourment on my blog.. :) I live in the South where it is all about country-style cooking. I love that you include a section for your "flops"... it makes it much easier to relate to a cook that admits it is not all perfect. There are a few of us that are doing a little random blogging about Cooking Ahead/ Freezer Meals to save time, if you want to join in we would all love it! Like I said it is very random, but it may be something we turn into a bit of a meme. Nice to "visit" with you! Thanks for stopping in, Lori, Sara, Tracey, and Kathryn. 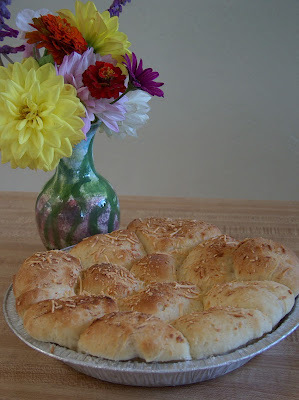 Shannon, what a great idea to blog about cooking ahead and freezer meals. I'll have to put on my thinking cap to see what I can come up with. Isn't it fun to pull something out of the freezer for dinner? Somehow those dinners taste soooo much better! Last night I pulled out a jar of roasted tomato soup I'd made and frozen last fall. Yum!! what kind of jam did you use? I've never heard of those types of berries before. Berji's domain, the recipe called for strawberry jam, but I used olallieberry. It's like a large blackberry. They have farms near us where you can go pick olallieberries in late May/early June. So every year we go load up and make jars and jars of jam. It is the best! You could substitute any blackberry jam, though, and it'd be pretty similar. They are cute! My hubby would probably love it. No, I haven't read the book. I checked it out once and read a few pages, but never got behind that. Just got to busy. Now you've piqued my intererst again! BTW, my mom absolutely LOVED your book. She read it cover to cover in a heartbeat! About Peter Walsh's It's All Too Much: maybe your library has it on tape. It was a great book and well worth reading/listening to. Very cute! Great for Mother's Day, too. I LOVE this idea! What a terrific idea to add color and interest to a brunch buffet! I cook, bake, eat chocolate, and sneak out to Starbucks from northern California, where I live with my family. 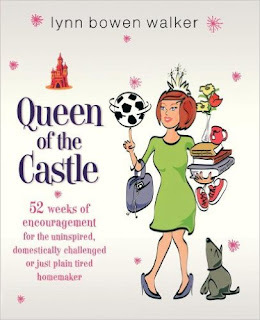 I wrote a book, Queen of the Castle: 52 Weeks of Encouragement for the Uninspired, Domestically Challenged or Just Plain Tired Homemaker, because I think running a home and loving your family is one of the most important jobs in the world. And some of us? Could use a little help. It Seemed Like a Good Idea at the Time . . .